DEARBORN, Mich. (CNS) — Parishioners need their priests. But priests need their parishioners. 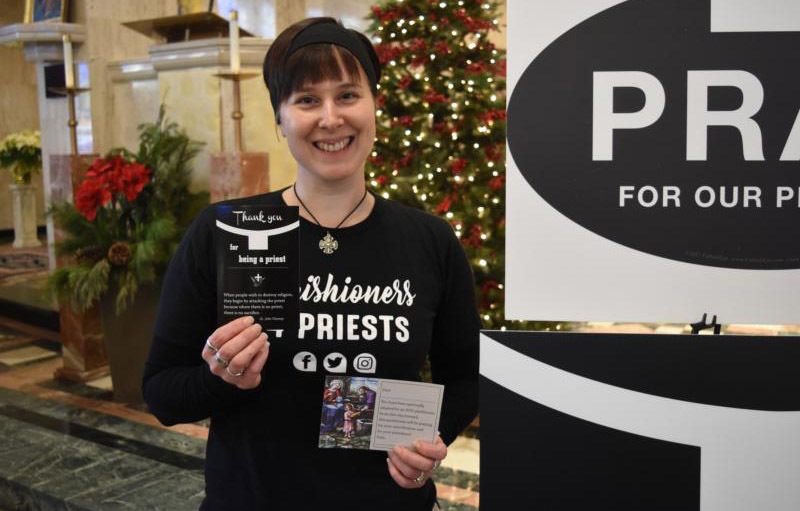 That’s the spirit behind Parishioners for Priests, a grass-roots movement that encourages Catholics to give local priests the one thing they need most: prayers. The movement began on Palm Sunday 2017 and since has grown to 559 followers on Facebook. Each day, one of the active priests of the Archdiocese of Detroit is selected as the “priest of the day,” and the followers of the page take time to say a prayer for that priest. The simple but effective way to pray from priests was started by Mindy DeWitt, a parishioner at the Church of the Divine Child in Dearborn. “I felt priests really need to be prayed for,” DeWitt told The Michigan Catholic, the archdiocesan newspaper. “I saw a Vatican document ‘Eucharistic Adoration for the Sanctification of Priests and Spiritual Maternity,’ on the (U.S. Conference of Catholic Bishops) website. It was about having Holy Hours for praying for priests and spiritually adopting a priest. Those discussions spurred DeWitt to action. In addition to praying for the “priest of the day,” those interested can spiritually adopt a priest for whom they’ll be responsible for praying. DeWitt uses an app on her iPad that randomly selects the name of a priest in the Detroit Archdiocese who hasn’t been adopted yet. The parishioner then receives a confirmation email and a card with the name of the archdiocesan priest on it, instructing the person to pray daily for the priest’s sanctification. To date, 105 priests have been adopted, but more than 200 active priests in the archdiocese await adoption. Parishioners can’t select which priest they are going to adopt, and the adoptions are done anonymously — a system DeWitt thinks works well. When a person adopts a priest, they have the option to send him a “spiritual bouquet,” a postcard the parishioner can fill out detailing what they are doing for the priest. DeWitt hopes that soon enough, every priest in the archdiocese will be adopted, and every parish will have some sort of Holy Hour dedicated to praying for priests.